An international team of scientists headed by physicists from Collaborative Research Centre 1238, “Control and Dynamics of Quantum Materials” at the University of Cologne, has used resonant inelastic X-ray scattering, at the European Synchrotron Radiation Facility (ESRF) in Grenoble, to execute a new variant of the basic double-slit experiment. The double-slit experiment is fundamentally vital in physics. Over two centuries earlier, Thomas Young achieved diffraction of light at two adjacent slits, thus producing interference patterns, or images based on superposition, behind the double slit. Thus, he demonstrated the wave character of light. 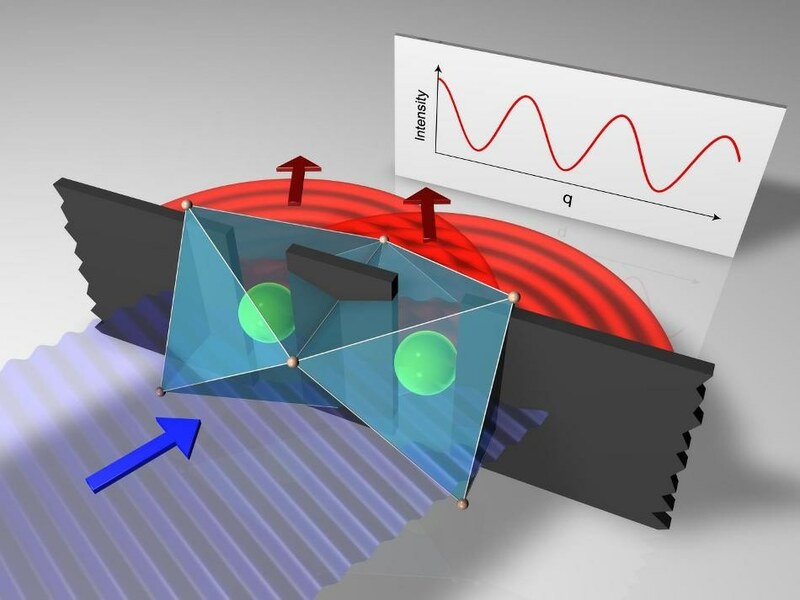 In the 20th century, researchers have demonstrated that molecules or electrons scattered on a double slit exhibit the same interference pattern, contradicting the classical expectation of the behavior of particles. However, this can be explained in quantum-mechanical wave-particle dualism. On the other hand, the scientists in Cologne analyzed an iridium oxide crystal (Ba3CeIr2O9) using resonant inelastic X-ray scattering (RIXS). Strongly collimated, high-energy X-ray photons are used for irradiating the crystal. The iridium atoms in the crystal scatter the X-rays by assuming the role played by the slits in Young’s classical experiment. Thanks to the rapid technical development of RIXS as well as a skillful selection of crystal structure, the physicists have currently been able to view the scattering on two adjacent iridium atoms, a purported dimer. The interference pattern tells us a lot about the scattering object, the dimer double slit. Grueninger leads the research team at the University of Cologne. Contrary to the classical double-slit experiment, the inelastically scattered X-ray photons offer information related to the dimer’s excited states, specifically their symmetry, and hence related to the solid’s dynamic physical properties. An advanced experimental setup and a modern synchrotron as an exceptionally bright X-ray light source are needed to perform these RIXS experiments. In order to excite particularly the iridium atoms, researchers must choose the very small proportion of photons with the ideal energy from the synchrotron’s broad spectrum, and selection of the scattered photons is even more strict based on the energy and direction of scattering. Only a portion of the photons stays back. In view of the accuracy that is needed, at present, these RIXS experiments can be carried out only at two synchrotrons across the globe, including the ESRF in Grenoble, where the researchers from Cologne performed their experiment. With our RIXS experiment, we were able to prove a fundamental theoretical prediction from 1994. This opens a new door for a whole series of further experiments that will allow us to gain a deeper understanding of the properties and functionalities of solids.